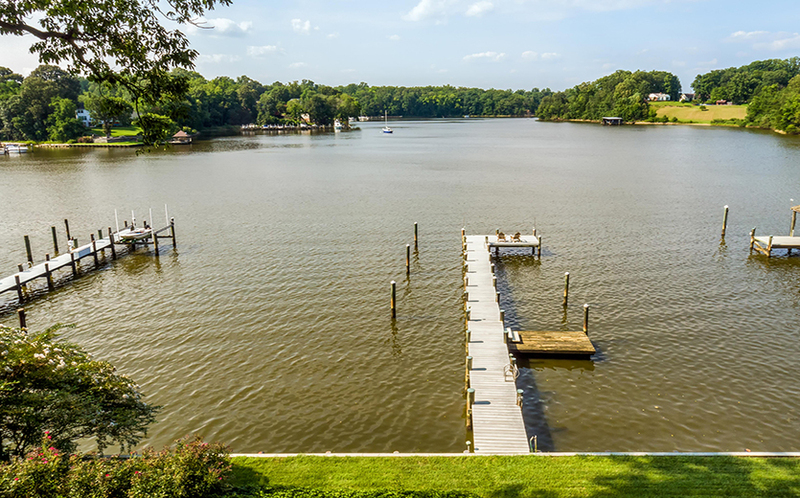 184 Southdown Road is located on Beards Creek off the South River in Edgewater. 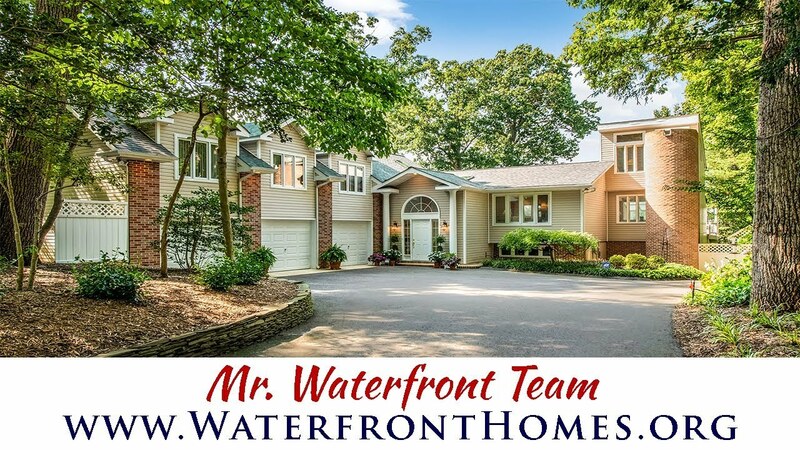 This exquisite home has a bright, open floor plan and awe-inspiring water views from nearly every room. 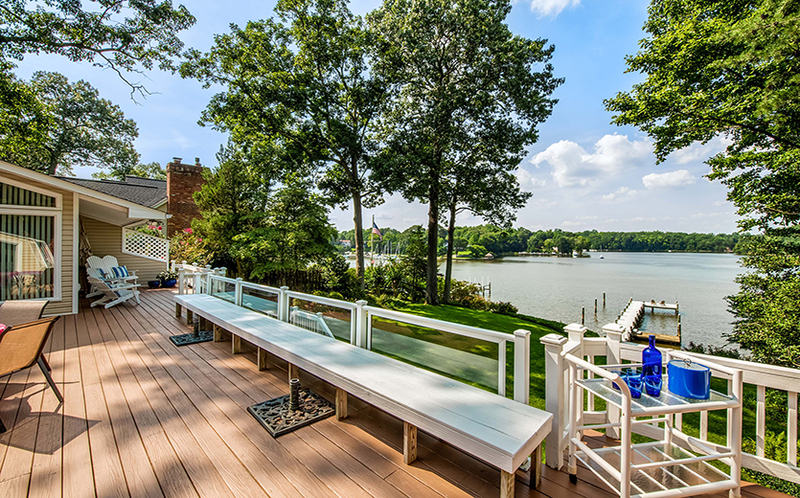 A waterside deck that spans the width of the house is a spectacular place to entertain, with built-in seating and glass panels that allow for unobstructed views. 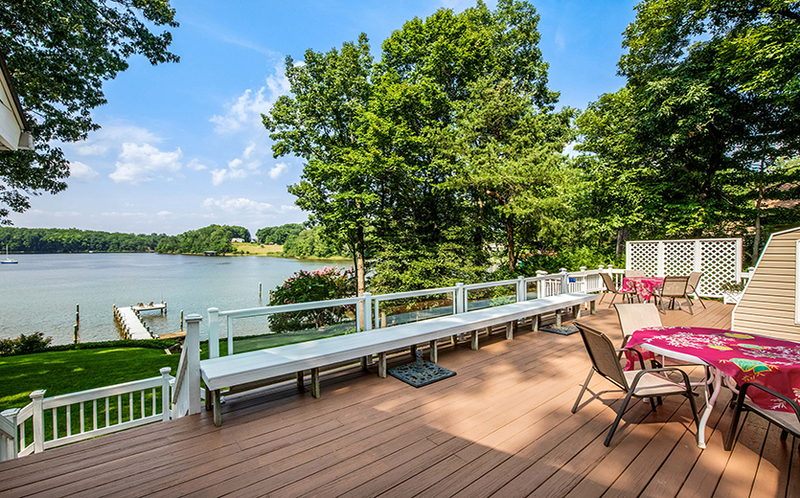 Additionally, a waterside patio on the lower, walk-out level is a relaxing place to take in the scenery. 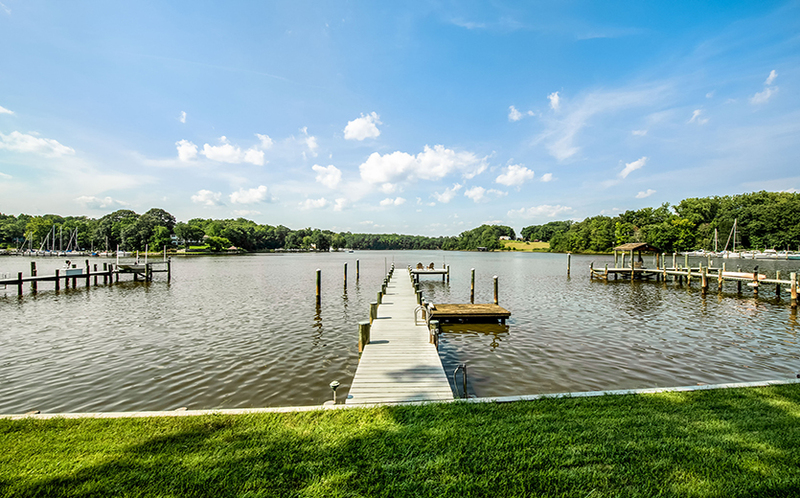 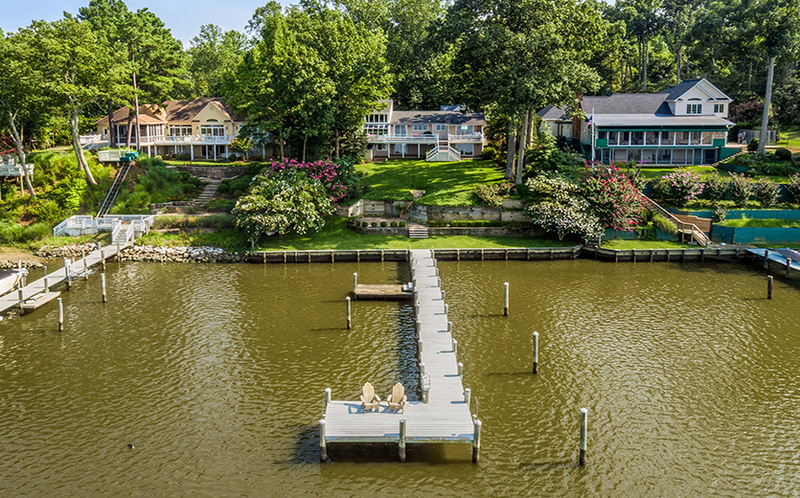 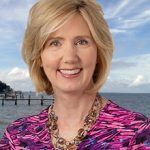 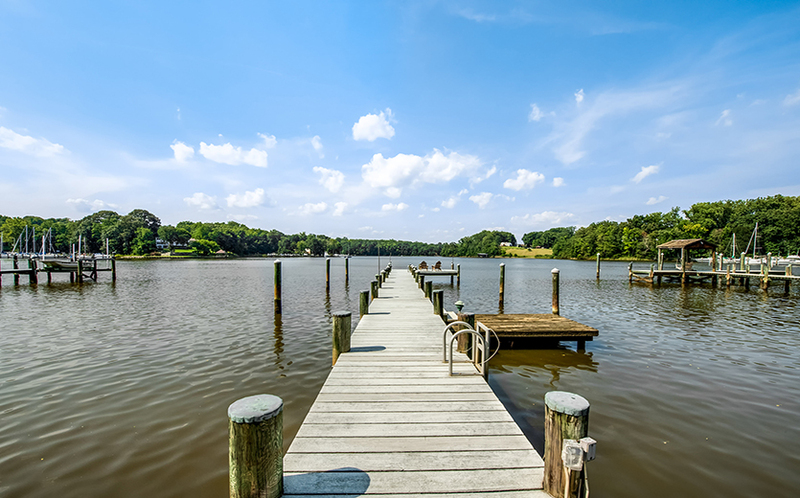 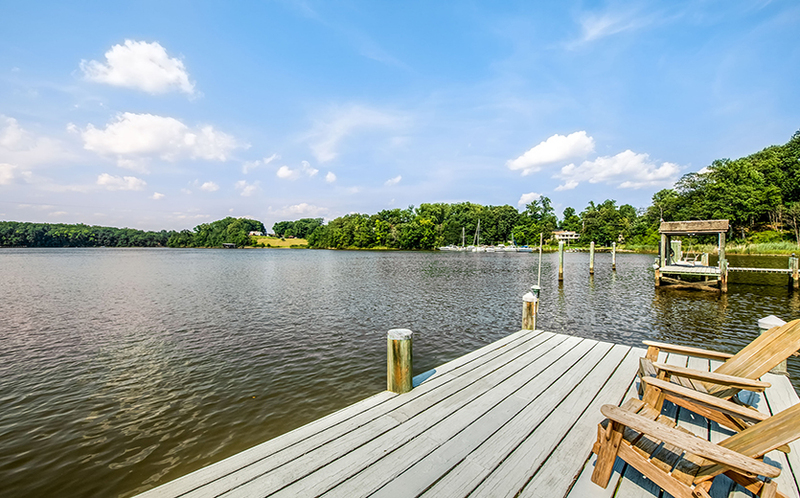 This peaceful setting offers quick access to the South River and Chesapeake Bay by boat, and is just a 15-minute drive to downtown Annapolis. 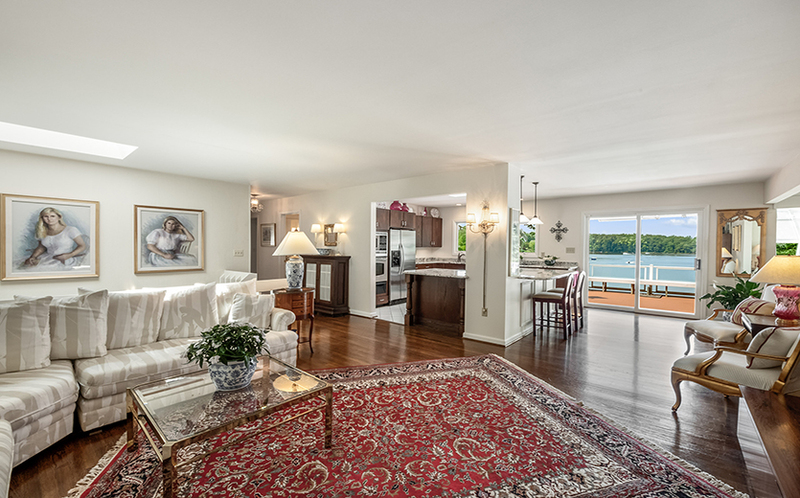 The main living area features a great room configuration that includes a spacious living room with beautiful hardwood floors that is open to the kitchen; the entire area has views out across the deck to the water. 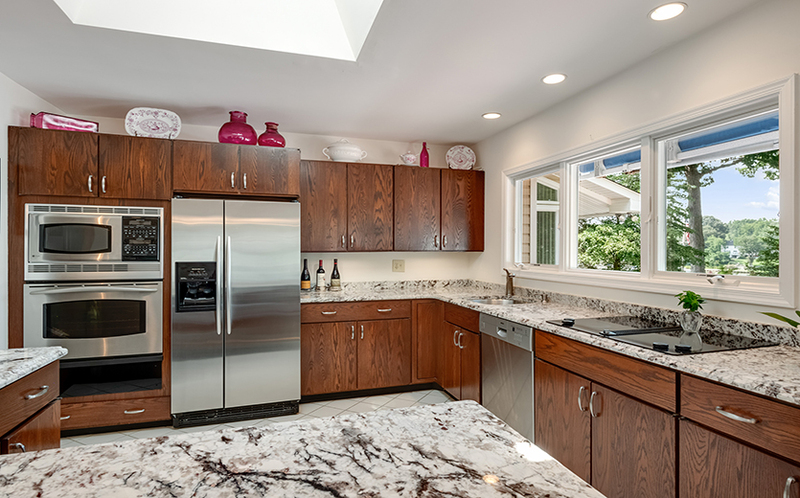 The kitchen has gleaming granite countertops and stainless steel appliances. 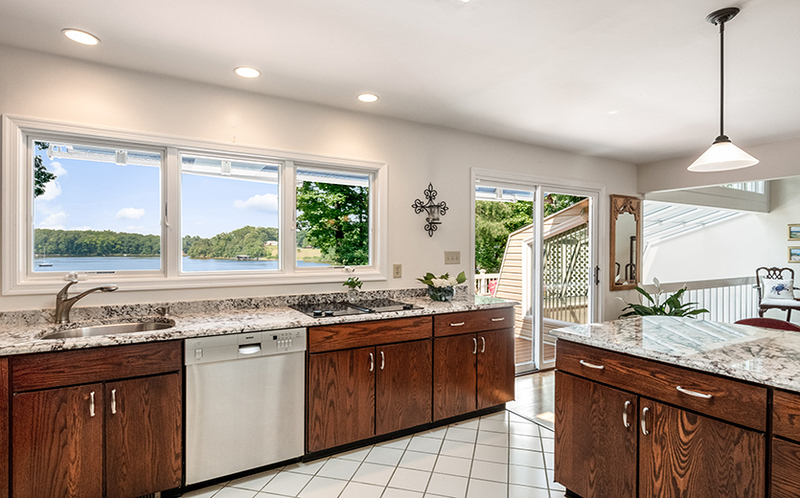 A skylight bathes the space in natural light and the chef can enjoy views of the water. 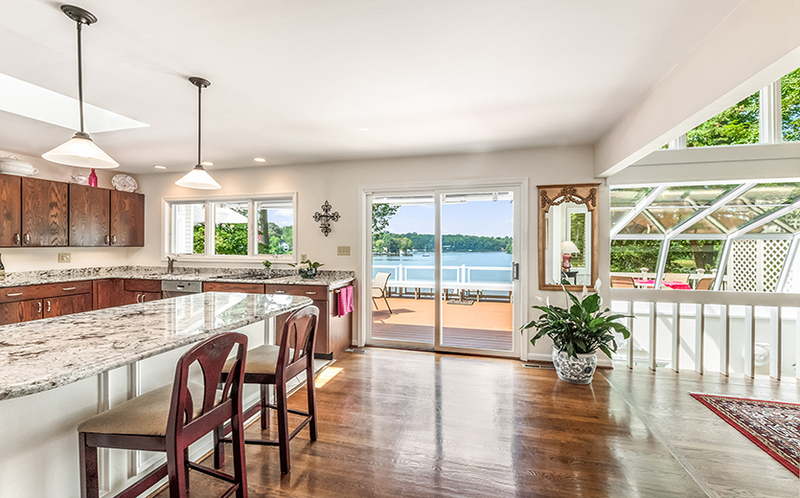 A breakfast bar allows for informal dining, and a formal dining room is adjacent to the kitchen. 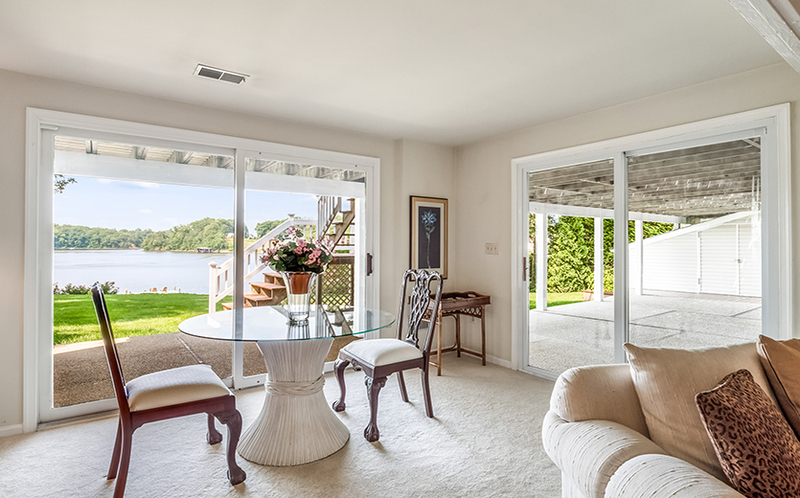 Step through the sliding glass doors to the waterside deck from the great room. 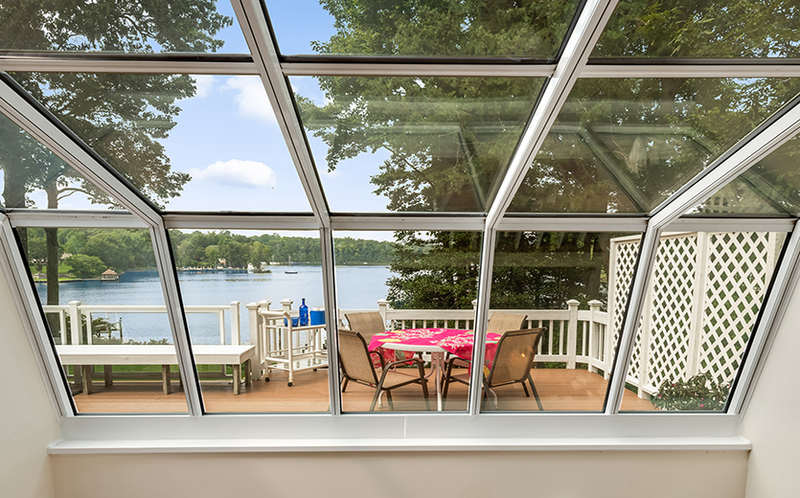 This is an incredible place to entertain your guests, enjoy an outdoor meal, or relax with a good book under the retractable awning. 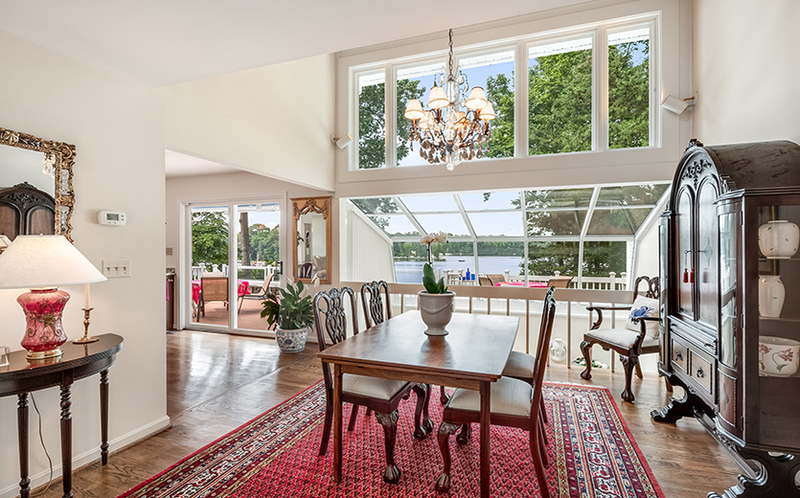 The dining room is a fabulous room with a two-story wall of windows overlooking the water. 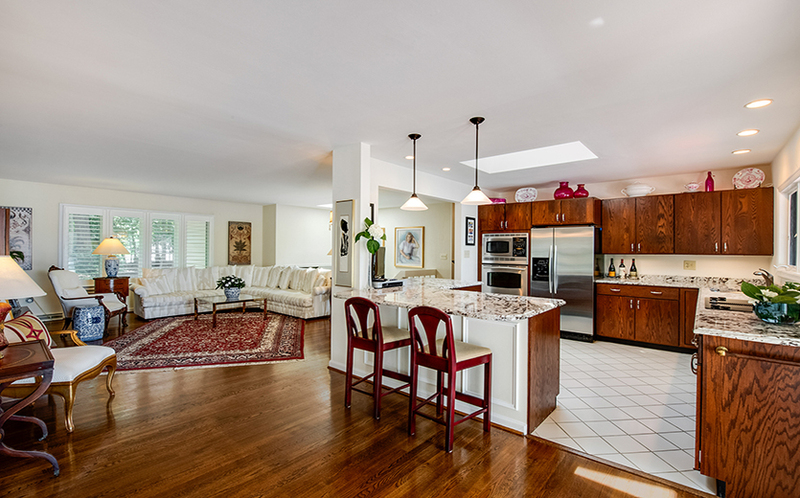 It overlooks the sunroom on the walk-out, lower level, and is bright and spacious. 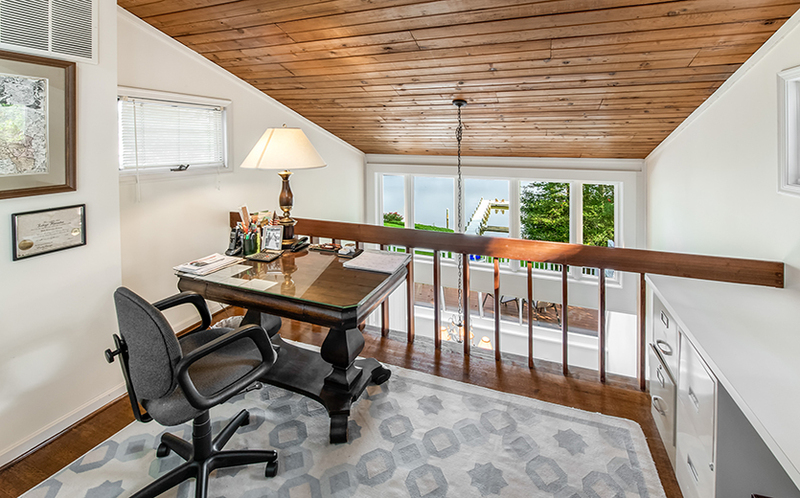 Tucked above the dining room is a cozy, wood-paneled loft – the perfect spot for a home office with a tranquil view. 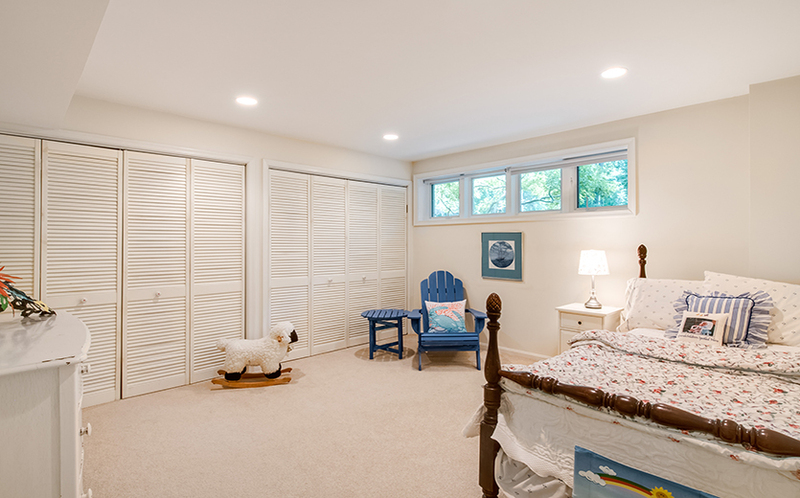 Down the hall from the main living area, the master suite has hardwood floors, a large walk-in closet, and sliding glass doors to the deck. 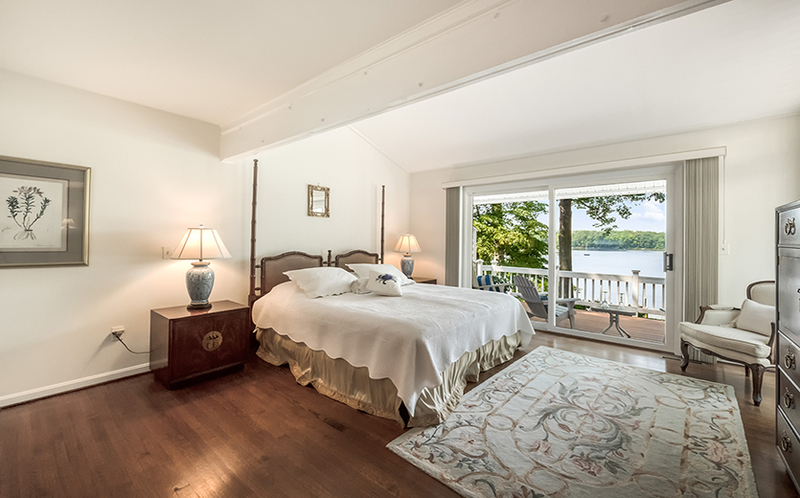 Enjoy the peaceful water views before you’re even out of bed! 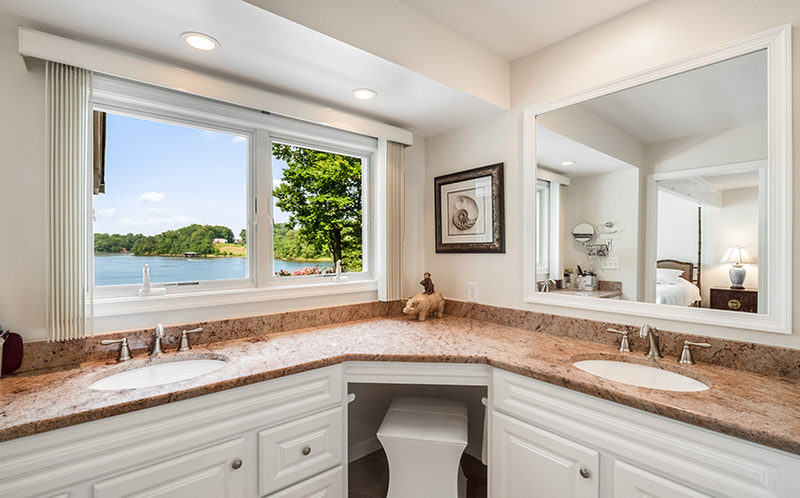 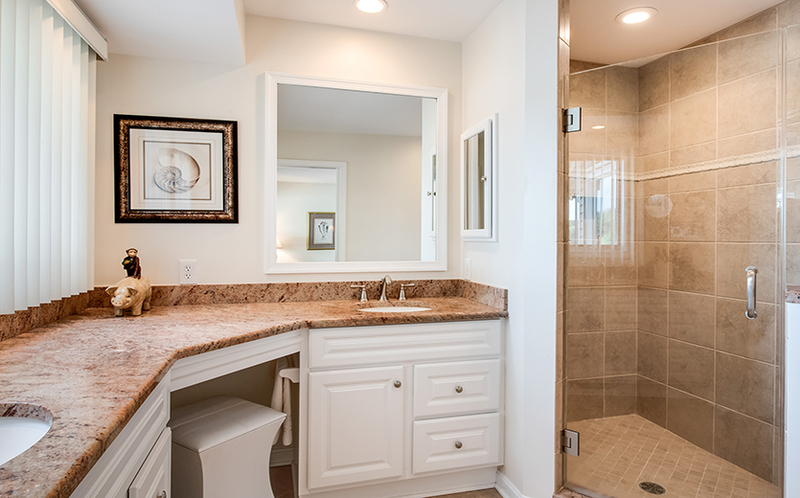 The master bathroom has double vanities with beautiful granite counters, water views, and an oversized shower. 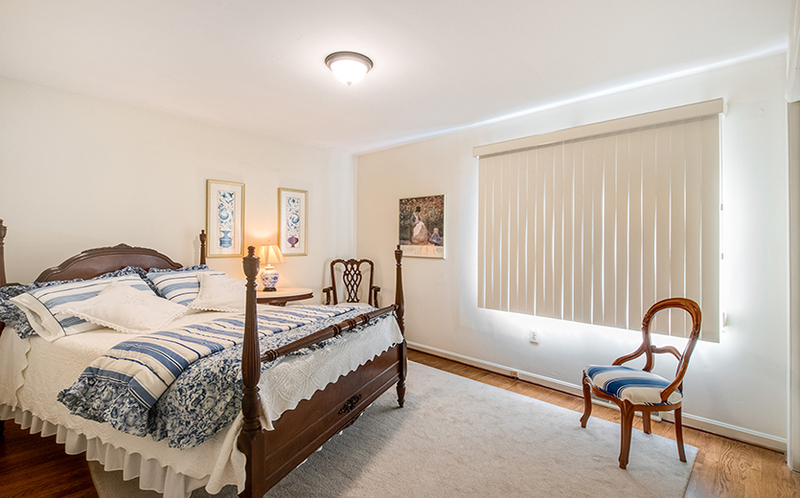 Also on this level are an additional bedroom and a den, both with hardwood floors. 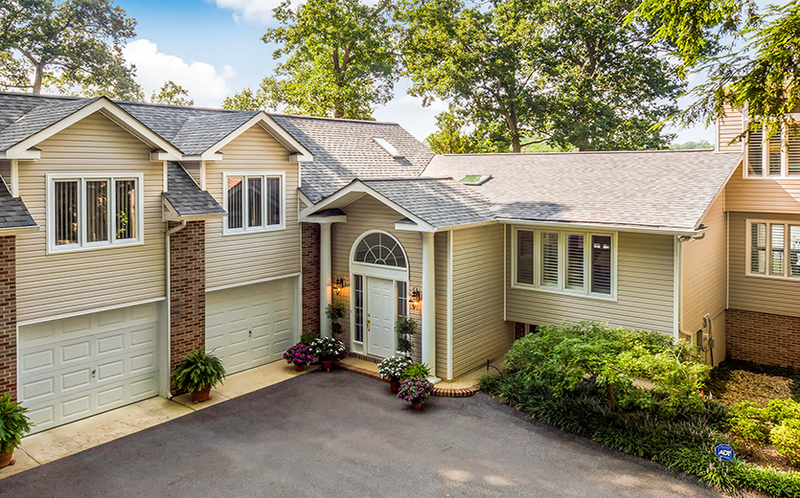 The walk-out lower level features a large family room that has built-in bookshelves and a wood-burning fireplace with a brick surround and tile hearth. 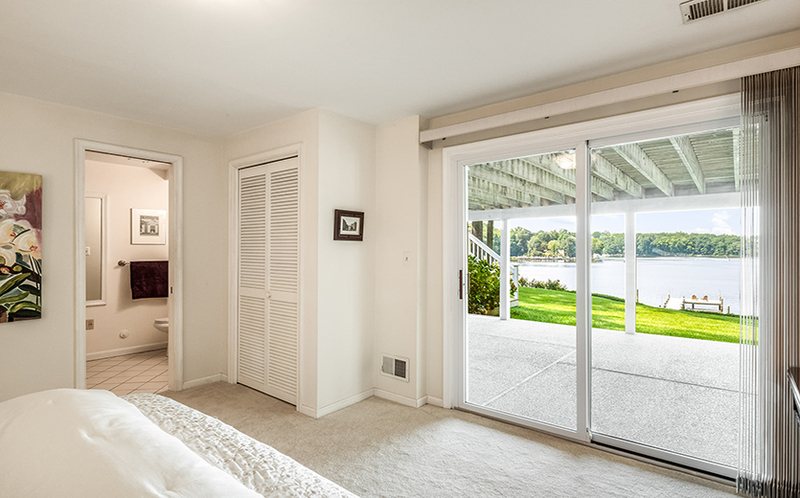 Sliding glass doors allow for unobstructed water views across the yard. 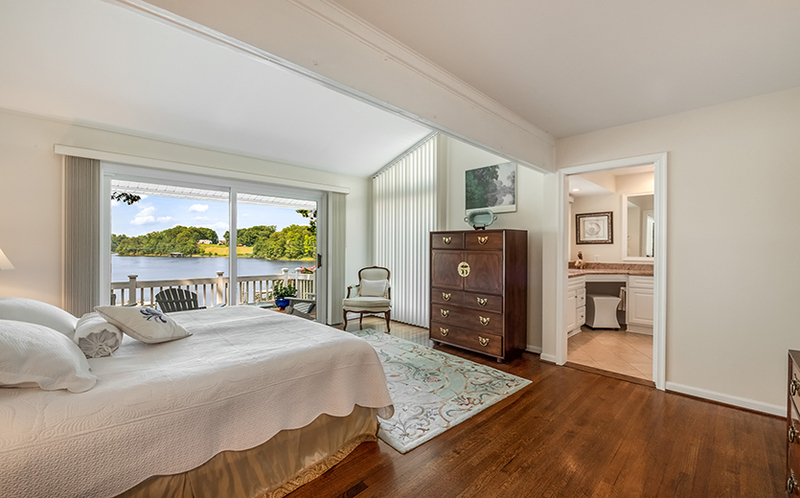 There are two bedrooms on this level, one of which has water views and sliding glass doors to a covered patio. 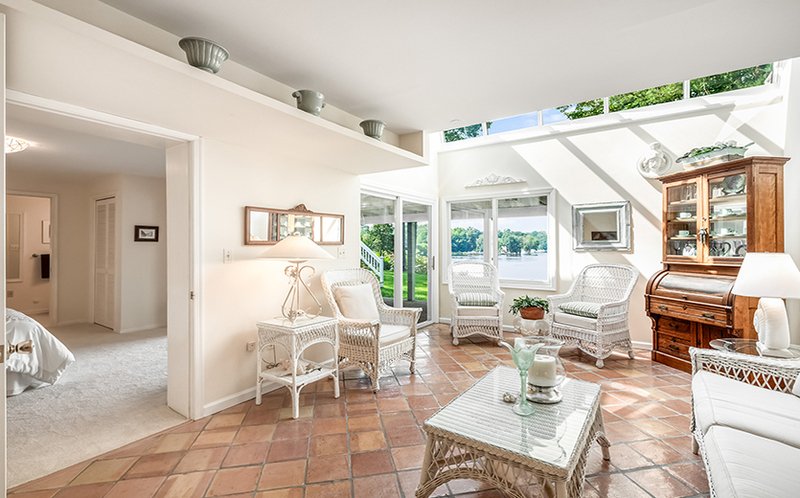 The sunroom, with beautiful tile floor, also accesses the patio and is open to the dining room above. 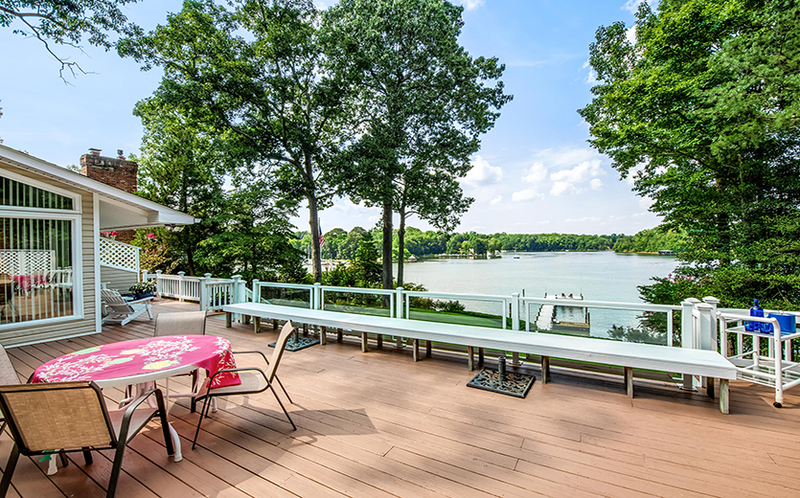 This delightful home has everything you could ask for and the views you’ve been dreaming of. 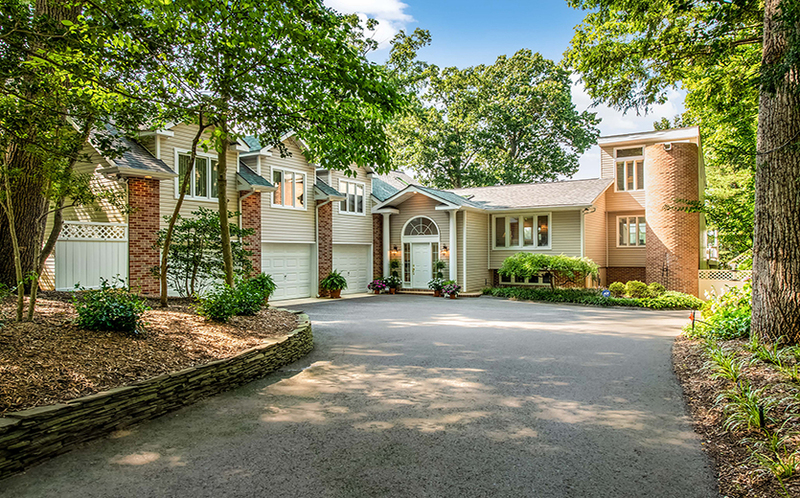 And, there is a huge unfinished space over the three car garage if you need additional room. 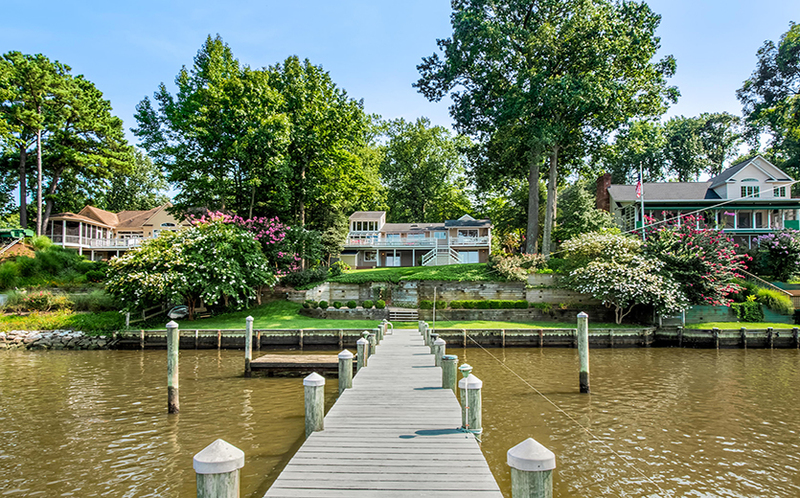 Conveniently located to Washington D.C. and Baltimore, this is the perfect waterfront retreat and is move-in ready! 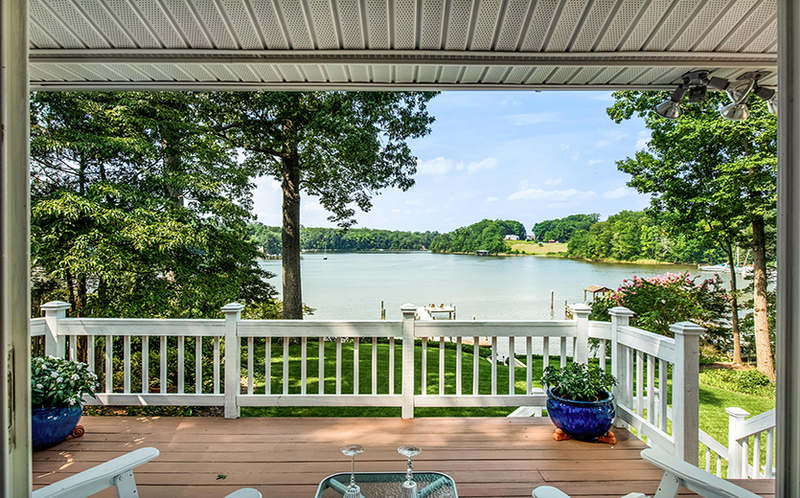 A third-level home office has an incredible view!